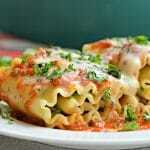 If you are like us and love lasagna in any form, then you should try this recipe for three cheese lasagna rollups. Keep reading to find out how easy it is! I do a lot of the cooking at our house, but one of the recipes that my husband loves to cook and which always turns out great is lasagna (check out his recipe here). He makes it a lot and it is one of our kids’ favorites! I have come to enjoy it so much that I have even made it for some of my family members in Mexico and they have loved it too. 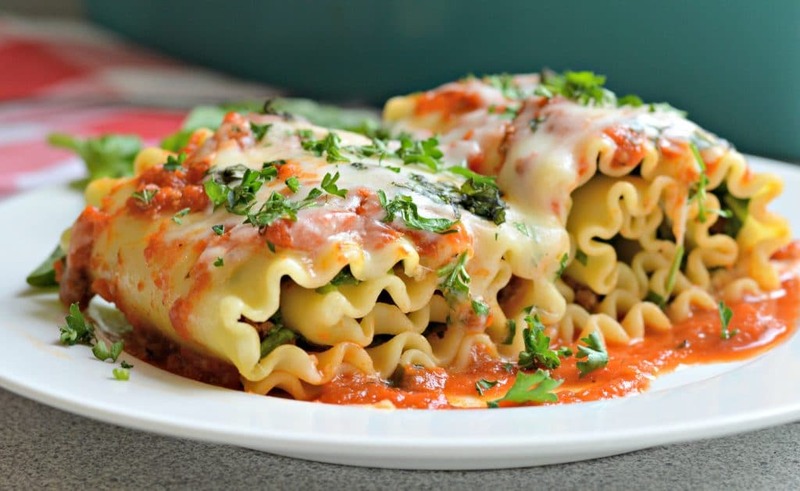 For today’s lasagna rollup version, he shared the secret for the delicious meat filling, and even though I am adding some extra ingredients to make it more healthy, I promise that you will still love it. I love this version because it has easy to eat, individual pieces and you can make as few or as many as you need depending on how many people will be eating. The first step is cook the past with salt and olive oil so that it has some flavor and doesn’t burn. Next, we add a delicious meat filling, seasoned and prepared with fresh ingredients to give it a delicious homemade taste. Finally, we will add a tasty mix of three cheeses. 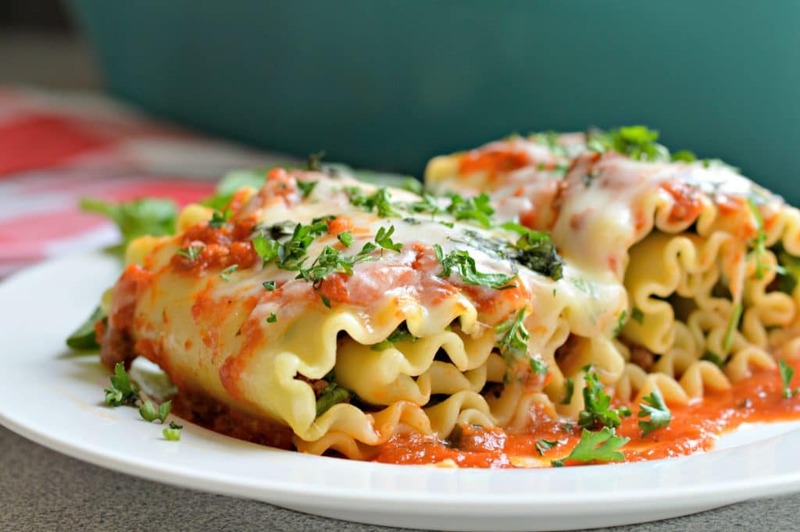 This lasagna rollups are easy to make and you and your family will love the three cheese mix. It has a great homemade flavor and I am sure that it will find a place on your weekly menu. The great thing about this recipe is that you can easily control the portions which is helpful if you are trying to eat more healthy. That said, I almost always have room for seconds – it is that delicious! I love adding my own flavor to all of my recipes and this was no exception. My husband is not a fan of ricotta cheese, but when I mixed it with mozzarella and Parmesan, he couldn’t even tell it was there and he loved it. 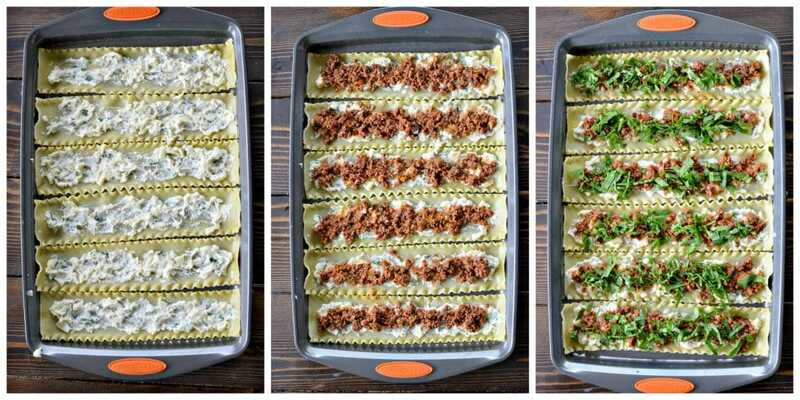 Another advantage to making lasagna rollups instead of traditional lasagna is that you can personalize the different rollups for different members of your family depending on their tastes. For example, my kids don’t like spinach, so I omitted that ingredient on their lasagna rollups. This is definitely a convenient recipe. I think that we will always love our traditional lasagna recipe, but it is definitely more difficult to have individual, personalized portions with that recipe and it is a bit more difficult to clean up. 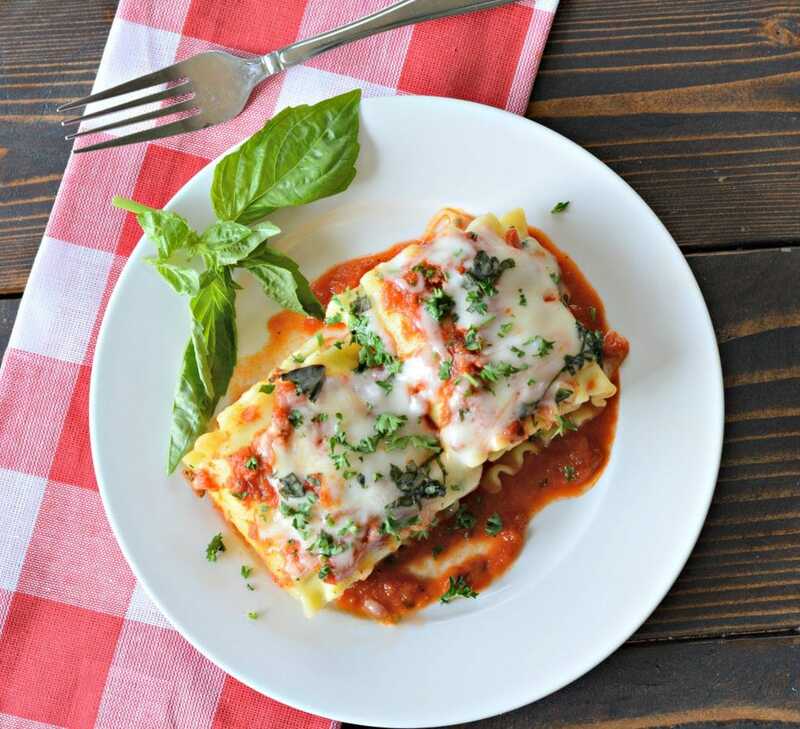 These lasagna rollups go great with homemade breadsticks and salad and is a perfect weeknight meal. 1 Package of Lasagna cooked according to package instructions. 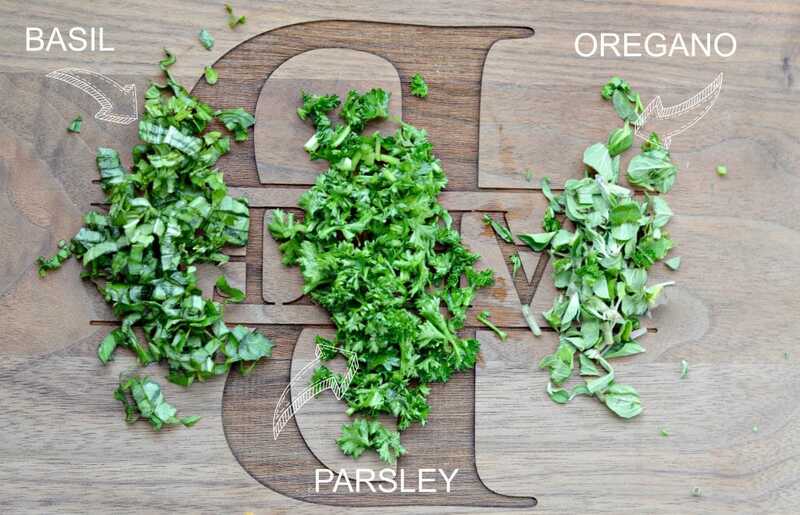 1/4 cup of additional fresh parsley finely chopped. Stretch the individual pieces of pasta out on a baking sheet. Cook the meat in a hot frying pan with olive oil and when it is almost all the way cooked through, add the garlic, onion, tomato paste (or sauce), parsley, basil, and oregano. 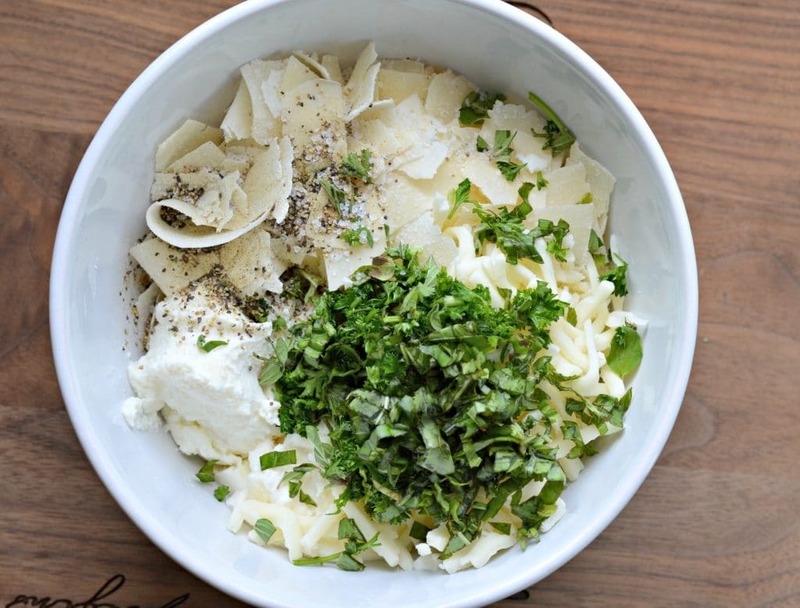 In a large bowl, combine the three cheeses and the parsley and mix well. Spread the cheese mixture along the length of each piece of pasta. Add the meat on top of the cheese mix. Add the spinach (if using) on top of the meat. Roll each piece of pasta up and put in a pre-greased glass baking dish. Add the remaining meat sauce on top and top with additional Parmesan and Mozzarella cheese. Bake for 30 minutes and eat hot. Do u cover this when baking? Hi Lorraine, whenever I have made this, I have not covered it. However, it wouldn’t hurt to cover it with aluminum foil for the first half of the cook time if you prefer. Let me know if you have any other questions.